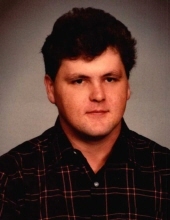 Mark Allen Looney, 55 years of age of Oakwood, VA, passed away Tuesday, December 4, 2018 at his home. Born November 12, 1963 in Grundy, VA, he was the son of the late Elige Radford Looney and Goldie Evelyn Fields Looney. Mark was a retired factory worker, enjoyed feeding the birds, and loved his dog “Precious”. He was a loving brother and uncle. In addition to his parents, he was preceded in death by his half-sister Betty Hubbard. Survivors include his sister Willie Lane of Oakwood, VA; brothers Harley Radford Looney, Roger Lee Looney and wife Pam all of Grundy, VA, Stevie Looney and wife Rhonda of Bluefield, VA, Elmer Looney of Oakwood, VA; half-brother Sonny Looney of Detroit, MI; half-sister Shirley Blaine of NC; several nieces and nephews. Funeral service for Mark Allen Looney will be held at the Shortridge-Ramey Funeral Home Chapel of Keen Mountain, VA, Friday, December 7, 2018 at 7:30 p.m. with Elder Roger Coleman and other Old Regular Baptist Ministers officiating. Burial will be at a later date at the Looney Family Cemetery in Troutman, NC. Active pallbearers will be his family and friends. The family will receive friends at the Shortridge-Ramey Funeral Home Chapel of Keen Mountain, VA, Friday after 6:00 p.m. prior to the funeral service at 7:30 p.m. The family of Mark Allen Looney have entrusted the care of their loved one to Shortridge-Ramey Funeral Home of Keen Mountain, VA.
"Email Address" would like to share the life celebration of Mark Allen Looney. Click on the "link" to go to share a favorite memory or leave a condolence message for the family.